Leaving the Galapagos is still too raw in my heart to write about, so instead, I thought I’d regale you all with a post on what a day in the life of a traveling backpacker might just be like. I just finished a few very long travel days, and here is my account of it and how no matter how long you backpack for, things are always an adventure (both good and bad). I spent the entire previous day dealing with my immediate loss of moving on from the Galapagos, a difficult thing in and of itself when your heart is aching thousands of miles away from your support system at home. On top of that is the stress of traveling on your own to new and unfamiliar places. From the Galapagos Islands, I spent the majority of my day flying several hours back to the mainland to the capital city of Quito. From there, I managed to swiftly make my way to the bus station and catch a 3 hour (at night) bus ride to a city called Ibarra. I could have stayed in Quito, but cities are expensive to get around and stress me out and traveling to Ibarra was one step closer to getting me to the Colombian/Ecuadorian border (even though night travel is often not the safest option). South America is a very large continent and busing around can take not only hours, but days, and making the most of your time is the best option. 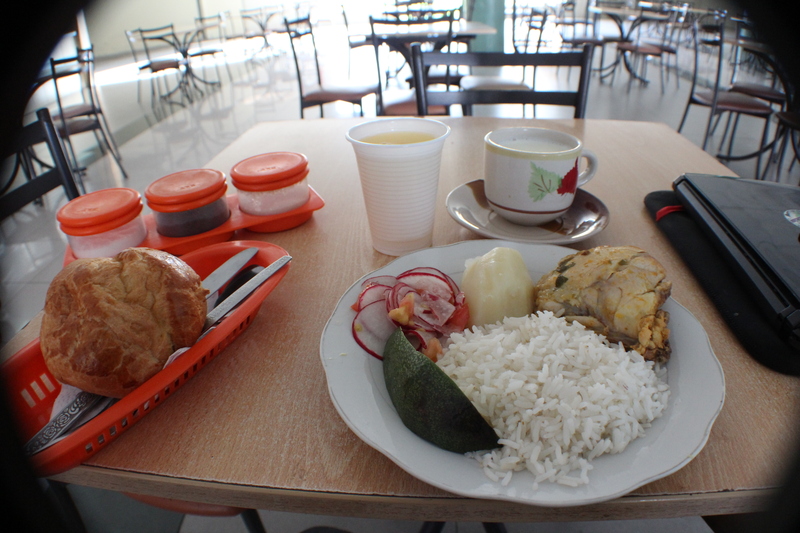 It’s not a photo of the llama, but a photo of my wonderfully cheap breakfast I ate while waiting for my bus, only $2.50US for all this food. So, after a quick sleep in this small city, I awoke around 6am knowing I’d need an early start to get all the way to Cali, Colombia (over 15 hours away by bus, not including time spent at the border). After packing and trying to sort out my lack of technology (it’s all broken or not working) and lack of communication with the world, I arrived at the bus station 7 minutes after a bus I was hoping to catch had left. Not exactly what I was hoping for as the next bus was well over an hour later. Could have been better, could have been worse, so instead, I took advantage of the extra bit of time and enjoyed a lovely, cheap breakfast with a view of a random llama in the bus courtyard to make up for it. My guesses on why there was a llama? The local lawnmower. I caught my 3 hour bus to the border town Tulcan and on the way had the awkward opportunity to end up sitting next to an older man who was very interested in speaking Spanish with me, the young, blonde, foreign girl who had no other seat option but to sit next to him. Thinking positively, it was more practice for my Spanish because my language skills are straight up pathetic. On the downside, I was tired and wanted to sleep and sometimes, the men in Latin America can be a little overbearing. Which he was. You know you’re in trouble when they ask you if you have a husband or boyfriend right away. Note for me for next time: lie and just say yes. The ring Willy gave me. He even put it on my finger. It’s actually kind of pretty so I’ll wear it and keep it as a very unique and interesting momento from South America. This guy, Willy, (email willy_loco10@… That should have been a sign) even gave me the ring on his finger he was wearing. Yup, seriously. He was telling me it was a gift for me. I tried to refuse repeatedly but then he just looked very offended so I figured I should just accept it. Odd and random and I have no idea what it meant or why he would give me the ring he was wearing. Next, he tried asking if I wanted to cross the border with him…. Uhhh.. Cue being thrown in jail because of some crazy drug scheme (although I think people are trying harder to get drugs out of Colombia than in, but still). Alarm bells shot off and I played dumb that I didn’t understand what he was saying in Spanish. Thankfully he got off the bus shortly thereafter and I was able to sleep for a bit before arriving safely in Tulcan. Next, I caught a taxi from the bus station to the border and got dumped between the two crossings. I walked back and stood in line for over an hour waiting to get an exit stamp from Ecuador. Normally border crossings are quick and painless, but for some reason Ecuador groups entering and exiting travelers all together so everyone gets to wait for everyone else, regardless of if you’re coming in or going out. Maybe not the most efficient in my opinion but nothing I could do about it, so I waited patiently to get my exit stamp. After, I popped over to the Colombian side, obtained my visa and talked with a taxi driver I had met earlier about needing a ride to a town called Las Lajas to see a Cathedral and then back to Ipiales to catch another bus. Right before I realized I was getting hosed by the taxi driver. At least he stopped at this viewpoint for me to see the Cathedral from afar. The countryside here is just stunning. It’s a bit hard to explain, but sometimes traveling on your own, keeping an eye on all your luggage and dragging it all around with you, communicating in Spanish, and being tired, alone, and hungry kind of makes you fed up and you decide to pick the easiest or first option available, even though you probably should look for a better one. The taxi driver was hosing me as he was expensive and not official but he was offering to take me to the Cathedral and then to the town I needed the bus from. I didn’t feel like having the same conversation with another driver as I just wanted to get going so I hopped in with him. In retrospect, I should have caught a different ride. My driver said for $10 he would take me to the cathedral and back to Ipiales, which sounded reasonable when you considered he’d watch my luggage and give me a ride back to catch my bus. Except what he really meant was it was that it was actually $12.50 and he was only taking me one way and dumping me with all my bags. This meant I would have to carry all my ridiculous amounts of luggage down to the cathedral and back up, and then get another ride back somehow. I wanted to drop a serious swear word at that moment when I realized this and he drove off. I should have refused to pay the ridiculous fare and thrown a fuss, but that’s not really my personality (I hate confrontation), plus, I don’t actually know enough Spanish to say any of that so he would understand. Next time, I need to be less lazy, know more Spanish, and have a better backbone and refuse to pay the ridiculous fare. So. I carried my many kilograms of luggage all the way down about a million stairs just to see a church. Except, I have to be honest, the church was pretty fantastic and could be something out of a medieval fairytale. It’s built across a gorge with a river rushing underneath it and waterfalls flowing down the sides of the canyon. It’s kind of magical. Despite my aching back, grumpy attitude, and frustration at my idiocy, I managed to find a moment to enjoy the Cathedral. And, on the upside, as I was struggling back up all the stairs, a Colombian couple offered to help me carry my luggage, and they also helped me arrange a colectivo (group taxi) back to Ipiales for only $1. There are not so wonderful people in this world (the taxi driver who took advantage of me), and then there are really awesome people who more than make up for the not so good ones. How can you be grumpy when you are looking at some incredibly impressive architecture like this? It was worth the backbreaking labour of hauling my bags back up the stairs. After my $1 ride, I made it to the bus station in Ipiales, but the bus I needed wasn’t leaving for another 4 hours. It was going to be a 12 hour ride overnight on a road that is supposedly not recommended for night travel. But, on the upside of that, I met two friendly Peruvians and Chileans taking the bus as well and spent the afternoon with them and felt a little better about traveling at night on a dangerous road. I also figured with a night bus, I can save on accommodation and time wasted traveling during the day, even though I’d miss some of the spectacular scenery along the way. Always a positive to balance out a negative. As one final (funny now looking back on it) mishap to my up-and-down travel day, earlier at the border I had exchanged only a small amount of American money to Colombia Pesos (exchange rate is about 1$ US for 2000 pesos), and I needed some more so I decided to get some out of the ATM. Except, like the not-clearly-thinking-person I am sometimes, I forgot to add the extra three 0’s onto what I wanted from the ATM and I took out the equivalent of about $5 CAD. It cost me $8.50CAD in fees to take out only $5. I just about choked when I realized what I had done. My only option was to spend another $8.50 in crummy bank and machine fees to take out some more. Ah, at least I can look back and kind of giggle about my stupidity. And hey, I never said I was good with numbers, words are more my thing. And, in true Ashlyn-travel-style of never wanting to make a travel plan, I finally did some reading and researching about Colombia while on the bus (even though the promised WiFi wasn’t working) and realized that my plan the next day was no good and spontaneously changed it. Instead of a last-minute flight to Santa Marta (a flight which I hadn’t actually booked yet because it wouldn’t let me online) I decided to catch another five hour bus ride to make it to Salento, my final destination. And how thankful I am for changing my plans and having everything work out the way it did. 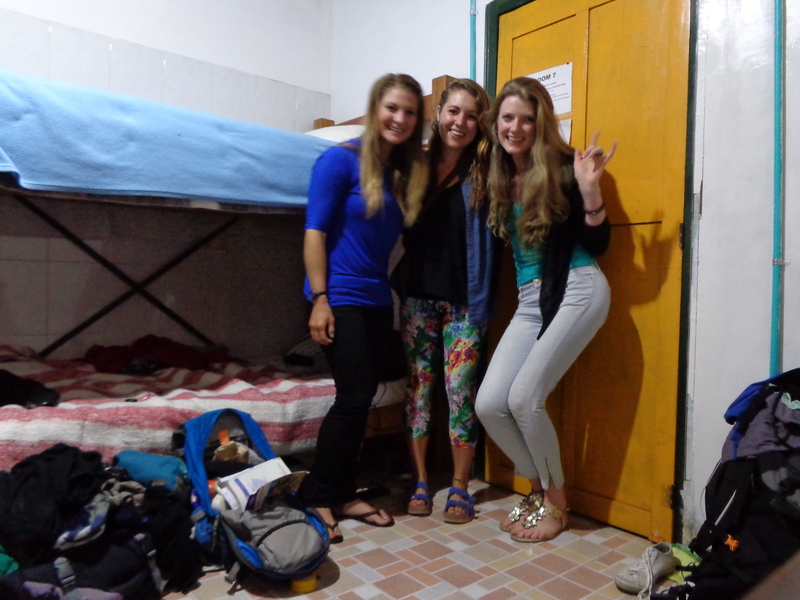 When I arrived in Salento, I met two other amazing women traveling South America, one from the UK and one from the US. We have had an incredible couple of days together and two of us actually extended our stay in Salento to spend more time all together. 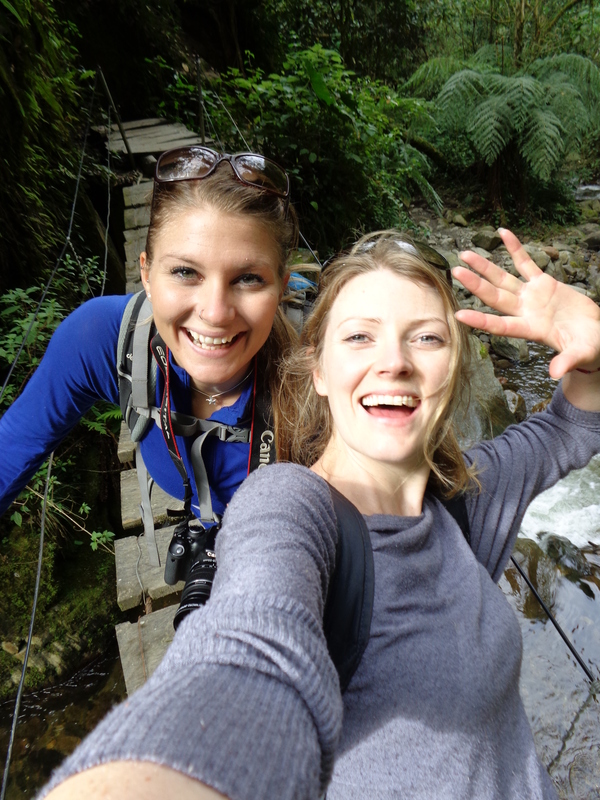 Mel and I on our adventurous tour of Valle de Cocora. We took about 4 hours longer than most people but it was because we were having way too much fun. Us three ready for a night out on the town in Salento with a crew of local guys. 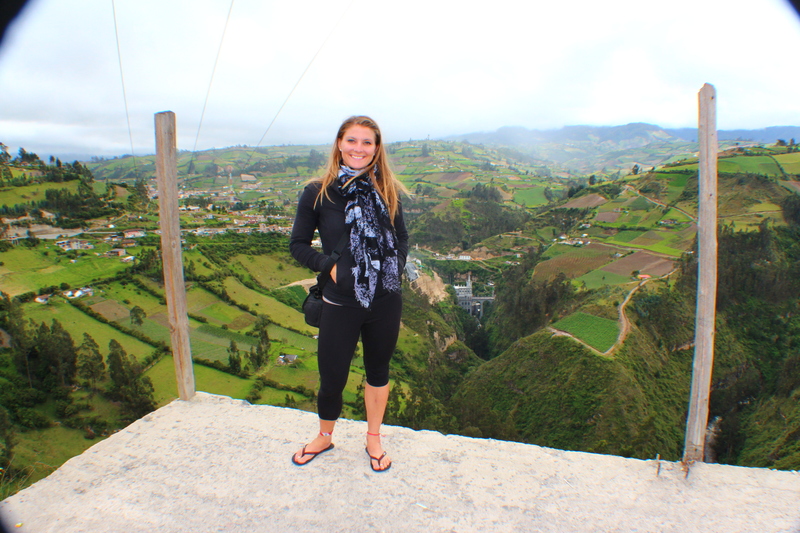 If it weren’t for all the mishaps and events along the way on my journey from Ecuador to Colombia, I would have missed out on an incredible little town and meeting two people who have left an imprint on my heart in a very short time. I’ve talked about the amazing bond you can build with travelers in other posts, and this is one of those times when I will have to say another bittersweet goodbye to my new ‘sisters’, but it will be worth every second of sadness for the memories and adventures we’ve shared together. And even though backpacking is an amazing experience, not every day is perfect and wonderful while on the road, but you can at least be guaranteed an adventure and some amusing stories to share afterwards that hopefully you can laugh about later. In all my travels I have had many mishaps. But it always seamed that for every dishonest or bad person that may have taken advantage, (or simply bad experience that occurred to me), there was always some one wonderful that more than made up for it. Ying and yang. Ask me about India one day when we meet up for our coffee.